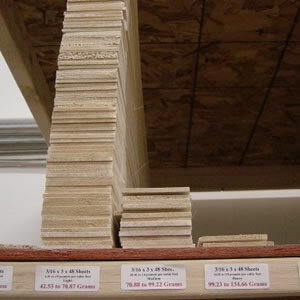 Balsa sheets are at least 1 inch wide and less than 1 inch in thickness. 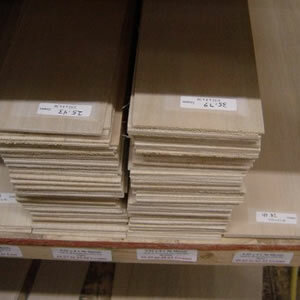 Balsa sheets are sometimes called balsawood sheets, balsa wood panels, balsa wood skins, and balsa single ply. We weigh our balsa sheets so if you need a specific density we should be able to find it for you. Balsa can vary between 3# (foam weight) - 40# (oak weight) for pounds per cubic foot (lbs/cuft) but the most common densities are 8-16 pounds per cubic foot. Balsa sheets are used for rc airplanes, sewing, decorations, laser projects, breakaway props, models, bridges, towers, laminates, ultra light balsa airplanes, surf boards, and for cutting kit parts. Thickness Inches 1" 2" 3" 4" 6" 8" 12"
Weighed by grams into specific weight categories.